Combining its historical know-how in the crafting of steel and its expertise in oenology, Peugeot offers an innovative cleaning system for high-quality carafes that is fast, simple and efficient. 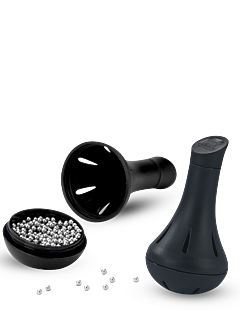 The Peugeot carafe cleaner is composed of stainless steel beads presented in a perforated case that promotes their drying and storage. Mixed with a bit of soapy water, and slowly and delicately swirled at the bottom of the carafe, they will remove the hard to reach residues, the tannin marks and limestone traces, and for the most beautiful carafes, they restore all their brilliance, sparkle and original purity, heralding future tastings of excellence.